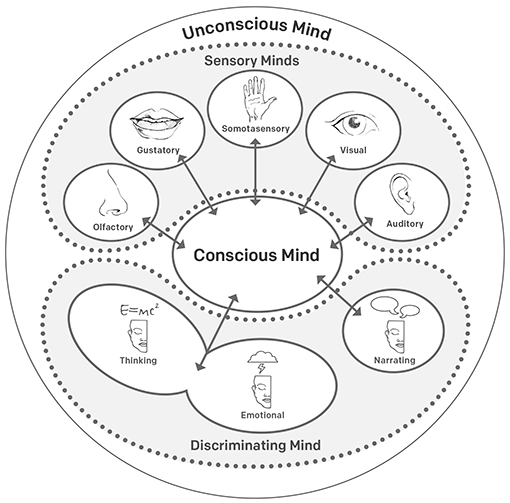 The Mind Illuminated (Amazon, SSC review), or TMI for short, presents what it calls the moments of consciousness model. 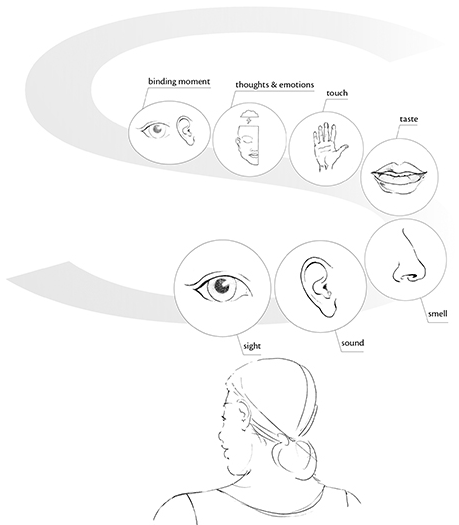 According to this model, our stream of consciousness consists of a series of discrete moments, each a mental object. Under this model, there are always different “subminds” which are projecting mental objects into consciousness. At different moments, different mental objects get selected as the content of consciousness. I want to replace our familiar idea of a stream of consciousness with that of illusory backwards streams. At any time in the brain a whole lot of different things are going on. None of these is either ‘in’ or ‘out’ of consciousness, so we don’t need to explain the ‘difference’ between conscious and unconscious processing. Every so often something happens to create what seems to have been a stream. For example, we ask “Am I conscious now?”. At this point a retrospective story is concocted about what was in the stream of consciousness a moment before, together with a self who was apparently experiencing it. Of course there was neither a conscious self nor a stream, but it now seems as though there was. This process goes on all the time with new stories being concocted whenever required. At any time that we bother to look, or ask ourselves about it, it seems as though there is a stream of consciousness going on. When we don’t bother to ask, or to look, it doesn’t, but then we don’t notice so it doesn’t matter. This way the grand illusion is concocted. Another example that Blackmore cites is change blindness. When people are shown an image, it’s often possible to introduce unnoticed major changes into the image, as long as people are not looking at the very location of the change when it’s made. Blackmore also interprets this as well to mean that there is no stream of consciousness - we aren’t actually building up a detailed visual model of our environment, which we would then experience in our consciousness. But on the other hand, as we reviewed earlier, there still seem to be objective experiments [LW · GW] which establish the existence of something like a “consciousness”, which holds approximately one mental object at a time. So I would interpret Blackmore’s findings differently. I agree that answers to questions like “am I conscious right now” are constructed somewhat on the spot, in response to the question. But I don’t think that we need to reject having a stream of consciousness because of that. I think that you can be aware of something, without being aware of the fact that you were aware of it. Notice that at the first timestep, the robot was aware of the fact that it was raining outside; this was the fact being broadcast from consciousness to all subsystems. But at no later timestep was it conscious of the fact that at the first timestep, it had been aware of it raining outside. Assuming that no subagent happened to save this specific piece of information, then all knowledge of it was lost as soon as the content of the consciousness workspace changed. Now there is a mental object in the robot’s consciousness, which encodes not only the observation of it raining outside before, but also the fact that the system was thinking of this before. That knowledge may then have further effects on the system - for example, when I became aware of how much time I spent on useless rumination while on walks, I got frustrated. And this seems to have contributed to making me ruminate less: as the system’s actions and their overall effect were metacognitively represented and made available for the system’s decision-making, this had the effect of the system adjusting its behavior to tune down activity that was deemed useless. The Mind Illuminated calls this introspective awareness. Moments of introspective awareness are summaries of the system’s previous mental activity, with there being a dedicated subagent with the task of preparing and outputting such summaries. Usually it will only focus on tracking the specific kinds of mental states which seem important to track. So if we ask ourselves “was I conscious just now” for the first time, that might cause the agent to output some representation of the previous state we were in. But it doesn’t have experience in answering this question, and if it’s anything like most human memory systems, it needs to have some kind of a concrete example of what exactly it is looking for. The first time we ask it, the subagent’s pattern-matcher knows that the system is presumably conscious at this instant, so it should be looking for some feature in our previous experiences which somehow resembles this moment, but it’s not quite sure of which one. And an introspective mind state, is likely to be different from the less introspective mind state that we were in a moment ago. This has the result that on the first few times when it’s asked, the subagent may produce an uncertain answer: it’s basically asking its memory store “do my previous mind states resemble this one as judged by some unclear criteria”, which is obviously hard to answer. With time, operating from the assumption that the system is currently conscious, the subagent may learn to find more connections between the current moment and past ones that it still happens to have in memory. Then it will report those as consciousness, and likely also focus more attention on aspects of the current experience which it has learned to consider “conscious”. This would match Blackmore’s report of “with more practice [the students] say that asking the question itself makes them more conscious, and that they can extend this consciousness from a few seconds to perhaps a minute or two”. Similarly, this explains me not being aware of most of my thoughts, as well as change blindness. I had a stream of thoughts, but because I had not been practicing introspective awareness, there were no moments of introspective awareness making me aware of having had these thoughts. Though I was aware of the thoughts at the time, this was never re-presented in a way that would have left a memory trace. In change blindness experiments, people might look at the same spot in a picture twice. Although they did see the contents of that spot at time 1 and were aware of them, that memory was never stored anywhere. When at time 2 they looked at the same spot and it was different, the lack of an awareness of what they saw previously means that they don’t notice the change. Introspective awareness will be an important concept in my future posts. (Abram Demski also wrote a previous post on Track-Back Meditation [LW · GW], which is basically an exercise for introspective awareness.) Today, I’m going to talk about its relation to a concept I’ve talked about before: blending / cognitive fusion. I’ve previously discussed “cognitive fusion” [LW · GW], as what happens when the content of a thought or emotion is experienced as an objective truth rather than a mental construct. For instance, you get angry at someone, and the emotion makes you experience them as a horrible person - and in the moment this seems just true to you, rather than being an interpretation created by your emotional reaction. You can also fuse with more logical-type beliefs - or for that matter any beliefs - when you just treat them as unquestioned truths, without remembering the possibility that they might be wrong. In my previous post, I suggested that many forms of meditation were training the skill of intentional cognitive defusion, but I didn’t explain how exactly meditation lets you get better at defusion. In my post about Internal Family Systems [LW · GW], I mentioned that IFS uses the term “blending” for when a subagent is sending emotional content to your consciousness, and suggested that IFS’s unblending techniques worked by associating extra content around those thoughts and emotions, allowing you to recognize them as mental objects. For instance, you might notice sensations in your body that were associated with the emotion, and let your mind generate a mental image of what the physical form of those sensations might look like. Then this set of emotions, thoughts, sensations, and visual images becomes “packaged together” in your mind, unambiguously designating it as a mental object. Note that this mental object is basically being taken as an axiomatic truth: what is in your consciousness, is that it is raining outside. Sensor 62 is reporting that [it’s raining outside]. (Subagent B:) Readings from sensor 62 are reliable 38% of the time. (Subagent C:) It is raining outside with a 38% probability. In my discussion of Consciousness and the Brain [LW · GW], I noted that one of the proposed functions of consciousness is to act as a production system, where many different subagents may identify particular mental objects and then apply various rules to transform the contents of consciousness as a result. What I’ve sketched above is exactly a sequence of production rules: at e.g. step 2, something like the rule “if sensor 62 is mentioned as an information source, output the current best estimate of sensor 62’s reliability” is applied by subagent B. Then at the third timestep, another subagent combines the observations from the previous two timesteps, and sends that into consciousness. What was important was that the system was not representing the outside weather just as an axiomatic statement, but rather it was explicitly representing it as a fallible piece of information with a particular source. At t1, there was the thought that [I am a bad person]. Blending: you are experiencing everything that a subagent outputs as true. In this situation, there’s no introspective awareness that would highlight those outputs as being just thoughts. “My friend is a horrible person”, feels like a fact about the world. Partial blending: you realize that the thoughts which you have might not be entirely true, but you still feel them emotionally and might end up acting accordingly. In this situation, there are moments of introspective awareness, but there are also enough of the original “unmarked” thoughts to also be affecting your other subagents. You feel hostile towards your friend, and realize that this may not be rationally warranted, but still end up talking in an angry tone and maybe saying things you shouldn’t. Unblending: all or nearly all of the thoughts coming from a subagent are being filtered through a mechanism that wraps them inside moments of introspective awareness, such as “this subagent is thinking that X”. You know that you have a subagent which has this opinion, but none of the other subagents are treating it as a proven fact. By training your mind to have more introspective moments of awareness, you will become capable of perceiving more and more mental objects as just that. A classic example would be all those mindfulness exercises where you stop identifying with the content of a thought, and see it as something separate from yourself. At more advanced levels, even mental objects which build up sensations such as those which make up the experience of a self may be seen as just constructed mental objects. In my next two articles, I’m going to discuss two particular things that an increased introspective awareness may be used for: unification of mind and an understanding of the so-called marks of existence. Andrés (Qualia Computing) here. Let me briefly connect your article with some work that QRI has done. The concept of blending is related to our concept of "The Tyranny of the Intentional Object". Indeed, some people are far more prone to confusing logical or emotional thoughts for revealed truth; introspective ability (which can be explained as the rate at which awareness of a having being aware before happens) varies between people and is trainable to an extent. People who are systematizers can develop logical ontologies of the world that feel inherently true, just as empathizers can experience a made-up world of interpersonal references as revealed true. You could describe this difference in terms of whether blending is happening more frequently with logical or emotional structures. But empathizers and systematizers (and people high on both traits!) can, in addition, be highly introspective, meaning that they recognize those sensations as aspects of their own mind. The fact that each moment of experience can incorporate informational traces of previous ones allows the brain to construct moments of experience with all kinds of interesting structures. Of particular note is what happens when you take a psychedelic drug. The "rate of qualia decay" lowers due to a generalization of what in visual phenomenology is called "tracers". The disruption of inhibitory control signals from the cortex leads to the cyclical activation of the thalamus* and thus the "re-living" of previous contents of experience in high-frequency repeating patterns (see "tracers" section of this article). On psychedelics, each moment of experience is "bigger". You can formalize this by representing each moment of experience as a connected network, where each node is a quale and each edge is a local binding relationship of some sort (whether one is blending or not, may depend on the local topology of the network). In the structure of the network you can encode the information pertaining to many constructed subagents; phenomenal objects that feel like "distinct objects/realities/channels" would be explained in terms of clusters of nodes in the network (e.g. subsets of nodes such that the clustering coefficient within them is much larger than the average clustering coefficient of different subsets of nodes of similar size). As an aside, dissociatives, in particular, drastically change the size of clusters, which phenomenally is experienced as "being aware of more than one reality at once". You can encode time-structure into the network by looking at the implicit causality of the network, which gives rise to what we call a pseudo-time arrow. This model can account for all of the bizarre and seemingly unphysical experiences of time people report on psychedelics. As the linked article explains in detail, how e.g. thought-loops, moments of eternity, and time branching can be expressed in the network, and emerge recursively from calls to previous clusters of sensations (as information traces). Even more strange, perhaps, is the fact that a long rate of qualia decay can give rise to unusual geometry. In particular, if you saturate the recursive calls and bind together a network with a very high branching factor, you get a hyperbolic space (cf. The Hyperbolic Geometry of DMT Experiences: Symmetries, Sheets, and Saddled Scenes). For instance, you might notice sensations in your body that were associated with the emotion, and let your mind generate a mental image of what the physical form of those sensations might look like. Then this set of emotions, thoughts, sensations, and visual images becomes “packaged together” in your mind, unambiguously designating it as a mental object. The claim we would make is that the very way in which this packaging happens gives rise to pleasant or unpleasant mental objects, and this is determined by the structure (rather than "semantic content") of the experience. Evolution made it such that thoughts that refer to things that are good for the inclusive fitness of our genes get packaged in more symmetrical harmonious ways. The above is, however, just a partial explanation. In order to grasp the valence effects of meditation and psychedelics, however, it will be important to take into account a number of additional paradigms of neuroscience. I recommend Mike Johnson's articles: A Future for Neuroscience and The Neuroscience of Meditation. The topic is too broad and complex for me to cover here right now, but I would advance the claim that (1) when you "harmonize" the introspective calls of previously-experienced qualia you up the valence, and (2) the process can lead to "annealing" where the internal structure of the moments of experience are highly-symmetrical, and for reasons we currently don't understand, this appears to co-occur in a 1-1 fashion with high valence. I look forward to seeing more of your thoughts on meditation (and hopefully psychedelics, too, if you have personal experience with them). *The specific brain regions mentioned is a likely mechanism of action but may turn out to be wrong upon learning further empirical facts. The general algorithmic structure of psychedelic effects, though, where every sensation "feels like it lasts longer" will have the downstream implications on the construction of the structure of moments experience either way. Sure! It is "invariance under an active transformation". The more energy is trapped in phenomenal spaces that are invariant under active transformations, the more blissful the state seems to be (see "analysis" section of this article). Definitely. I'll probably be quoting some of your text in articles on Qualia Computing soon, in order to broaden the bridge between LessWrong-consumable media and consciousness research. Of all the articles linked, perhaps the best place to start would be the Pseudo-time Arrow. Very curious to hear your thoughts about it. Huh! That's very interesting. Has your mind always been like that? As I'll discuss further in the next post, there are meditation techniques which are intended to get people closer to that level of introspective awareness, but I don't know whether anyone has reached the kind of a level that you're describing through practice. Born in part as a reaction against the acontextual excesses of the psychoanalytic movement, the systems-based models of family therapy traditionally eschewed issues of intrapsychic process. It was assumed that the family level is the most important system level to change, and that changes at this level trickle down to each family member’s inner life. Although this taboo against intrapsychic considerations delayed the emergence of more comprehensive systemic models, the taboo had the beneficial effect of allowing theorists to concentrate on one level of human system until useful adaptations of systems thinking could evolve. When my colleagues and I began our treatment project in 1981, bulimia was a new and exotic syndrome for which there were no family systems explanations or maps. In our anxiety, we seized the frames and techniques developed by structural family therapists for other problems and tried them on each new bulimia case. In several instances this approach worked well, so we leaped to the conclusion that the essential mechanism behind bulimia was the triangulation of the client with the parents. In that sense, we became essentialists; we thought we had found the essence, so we could stop exploring and could use the same formula with each new case. Data that contradicted these assumptions were interpreted as the result of faulty observations or imperfect therapy. Fortunately, we were involved in a study that required close attention to both the process and outcome of our therapy. As our study progressed, the strain of trying to fit contradictory observations into our narrow model became too great, too Procrustean. We were forced to leave the security and simplicity of our original model and face the anomie that accompanies change. We were also forced to listen carefully to clients when they talked about their experiences and about what was helpful to them. We were forced to discard our expert’s mind, full of preconceptions and authority, and adopt what the Buddhists call beginner’s mind, which is an open, collaborative state. “In the beginner’s mind there are many possibilities; in the expert’s mind there are few” (Suzuki, 1970, p. 21). In this sense, our clients have helped us to change as much as or more than we have helped them. The IFS model was developed in this open, collaborative spirit. It encourages the beginner’s mind because, although therapists have some general preconceptions regarding the multiplicity of the mind, clients are the experts on their experiences. The clients describe their subpersonalities and the relationships of these to one another and to family members. Rather than imposing solutions through interpretations or directives, therapists collaborate with clients, respecting their expertise and resources. I always felt urge to deconstruct the notion of "consciousness", as it mixes at least two things: sum of sensory experiences presented in form of qualia, and capability to verbally judge about something. It seems to me that in this post consciousness is interpreted in the second meaning, as verbal capability of "being aware". However, the continuity of consciousness (if it exists) is more about the stream of non-verbal subjective experiences. It is completely possible to have subjective experiences without thinking anything about them or remembering them. When a person asks "Am I consciousness?" and concludes that she was not consciousness until that question, it doesn't mean she was a phylozombie the whole day. (This practice was invented by Gurjiev, btw, under the title of "self-remembering"). The qualia interpretation was what I had in mind when writing this, though of course Dehaene's work is based on conscious access in the sense of information being reportable to others. It is completely possible to have subjective experiences without thinking anything about them or remembering them. When a person asks "Am I consciousness?" and concludes that she was not consciousness until that question, it doesn't mean she was a phylozombie the whole day. Agreed, and the post was intended (in part) as an explanation of why this is the case. It is interesting, is a person able to report something "unconsiousnessly"? For example, Tourette syndrome, when people unexpectedly say bad words. Or automatic writing, when, in extreme cases, a person doesn't know what his left hand is writing about. I've seen some authors use 'subjective experience' for the former and reserve consciousness for the latter. Unfortunately consciousness is one of those words, like 'intelligence', that everyone wants a piece of, so maybe it would be useful to have a specific term for the latter too. 'Reflective awareness' sounds about right, but after some quick googling it looks like that term has already been claimed for something else. Is she just teaching them to be eternally self-concious?